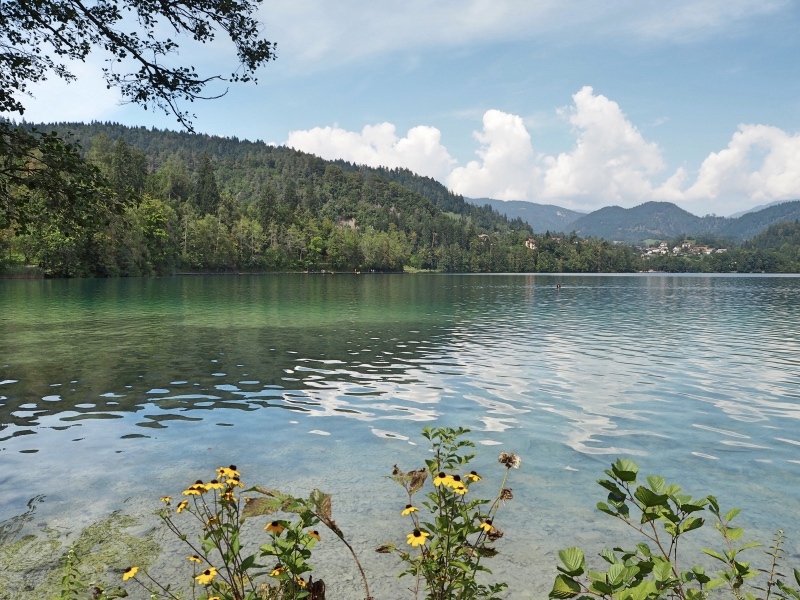 I doubt anyone would visit Slovenia without taking the time to experience the world famous glacial Lake Bled. 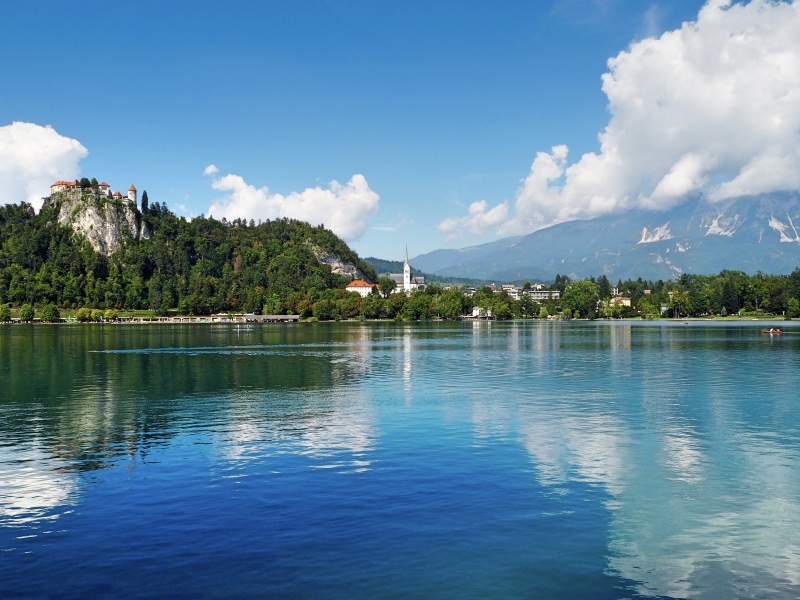 With a stunning backdrop of the Julienne Alps and with its beautiful clear turquoise water, Lake Bled is one of the most photographed lakes in the world. So when we spent three days in Zagreb at the end of our holiday, visiting Lake Bled was near the top of our itinerary. Because Lake Bled is only a two and a half hour drive from Zagreb, it was quite easy to visit just for the day. As we crossed the border from Croatia into Slovenia, the scenery became more mountainous and we were presented with beautiful views of Alpine peaks, softly rounded hills and vast plains. 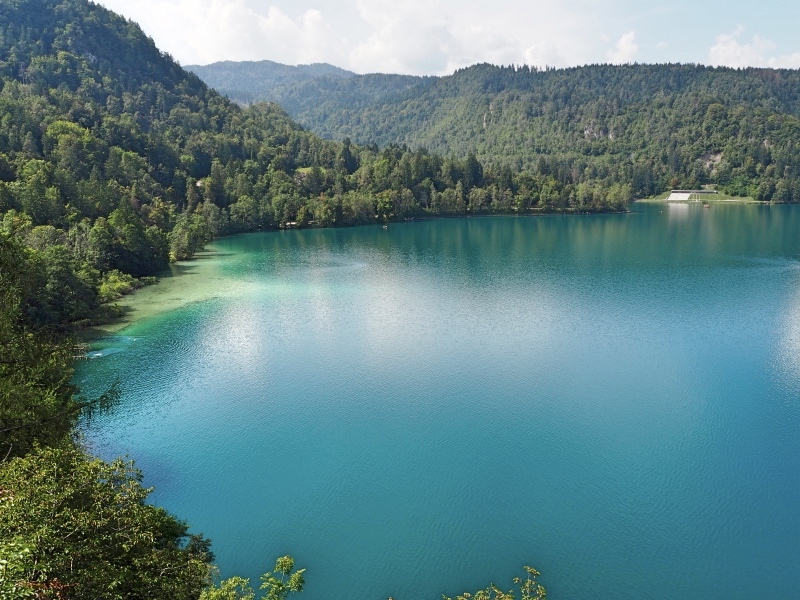 The small Bled island in the middle of the lake is visible from everywhere around the circumference of the lake. On our arrival Bled was very busy; traffic jams and cars everywhere. Parking was quite difficult and it definitely felt very touristy, which was a disappointment for us at first. But when we caught our first glimpse of the lake, that disappointment quickly melted away! A lucky swan living on the lake! A walking track runs along the lake’s shoreline; it is six kilometres or four miles long. We were told that the lake takes just over an hour to circumnavigate, but because we stopped at every corner for photos it took us nearly three hours! We had no choice. Surrounded by mountains and forest the lake is just so picturesque and breathtaking. Beautiful views around the lake! For the first quarter of the walk we, unfortunately, had a very overcast sky, but as we carried on the weather decided to improve. Once the sun was out the walk offered some amazing views and we fell in love with the scenery in front of us. The water was magnificent; it was unbelievably crystal clear. From the path along the water’s edge, we could easily see fallen tree trunks at the bottom of the lake and schools of fish swimming around them. Water that is so clear and so inviting ! 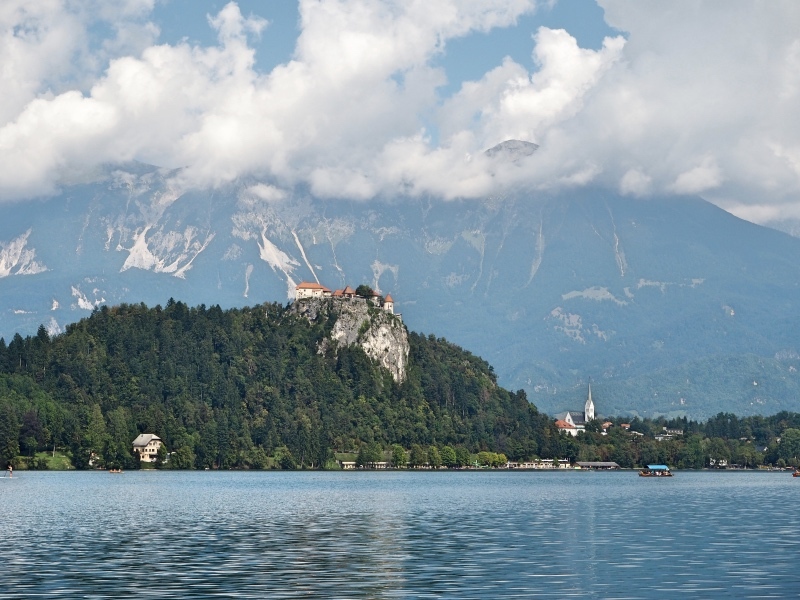 A visit to Lake Bled wouldn’t be complete without a visit to Bled island and the Church of Assumption. Set in the middle of the lake, they are visible from along the shoreline. Bled island in the middle of the lake with the Bled castle at the top of the hill. The small Bled island and the Church of Assumption in the middle. 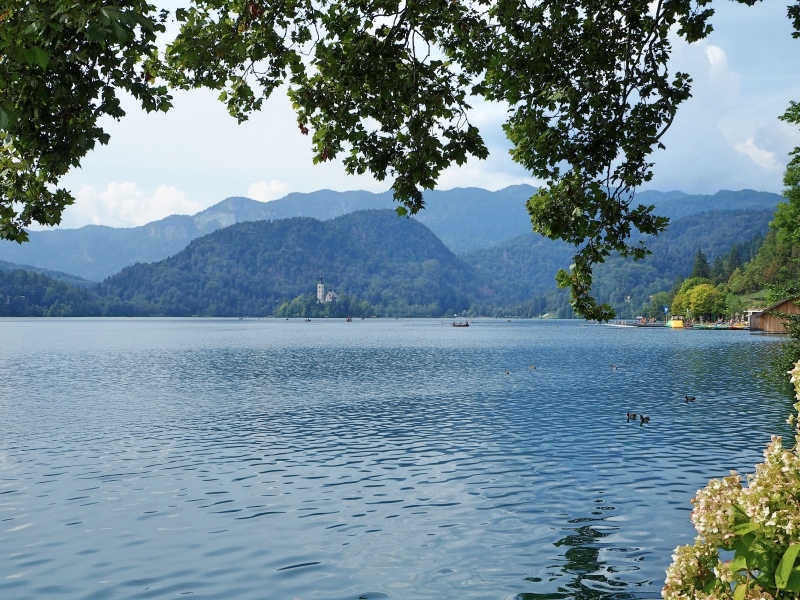 You can reach Bled island by taking Bled’s famous Pletna. This two-oared wooden boat is a cross between a gondola and a punt and is captained by a single oarsman. 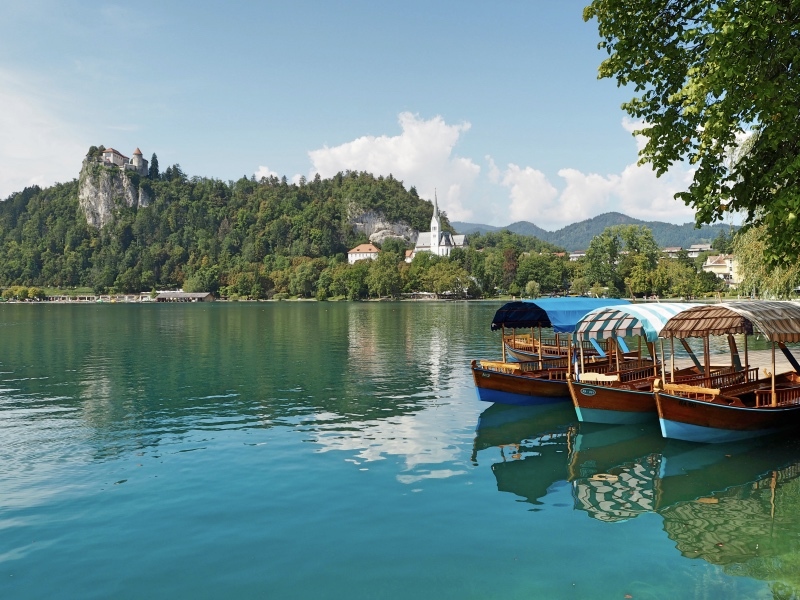 The Pletna is found only in Bled but you can catch a ride on one from many spots around the lake. The ticket is fourteen euros return and allows for a forty minute stay on the island which should be plenty. Another option is to rent your own boat. Some people even manage to swim to the island, but we wouldn’t recommend it unless you’re fit and an excellent swimmer! Once on the island, you will have stunning views of the lake and the castle that looks down upon it. The Pletna boats will take you to the island. For six Euros, you can visit the small pilgrimage church, but first, you must climb a hundred steps to get there! The island also has a souvenir shop and an ice cream shop to help you cool down after all that exercise! 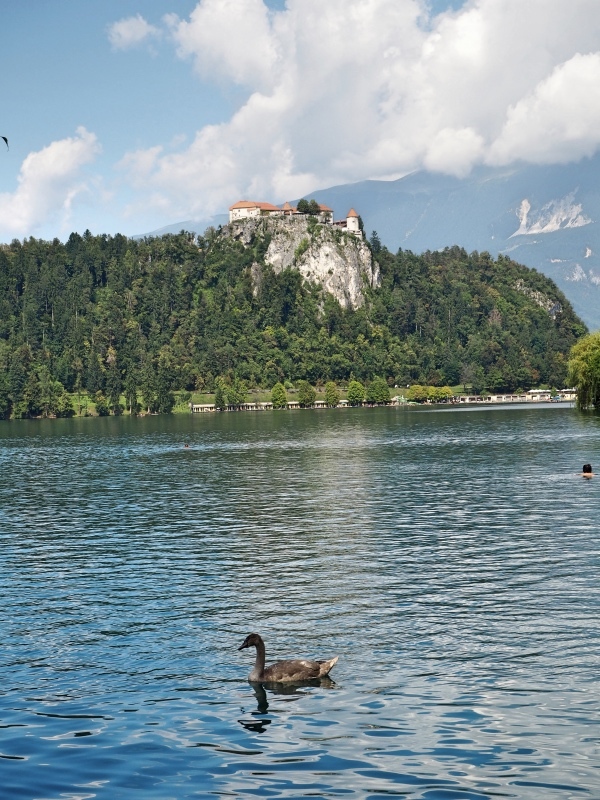 Bled Castle is a medieval castle perched one hundred and thirty meters above the lake. It is the oldest castle in Slovenia and for ten euros you can go inside for a visit. Inside there is a small museum, a souvenir shop and some very expensive dinner options. 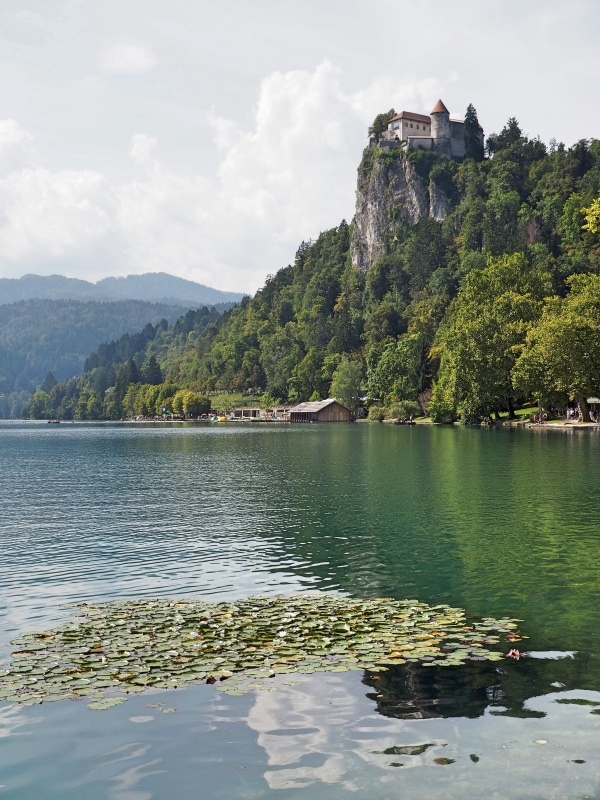 However, the best thing about the castle is the spectacular view that is provided over the lake and Bled island. The Bled castle at the top of the hill. If you are feeling fit, climb the steep set of steps that head up to the castle from the lake; but if you have a car and are feeling lazy, it is possible to drive up there and park. 4- Go for a swim! 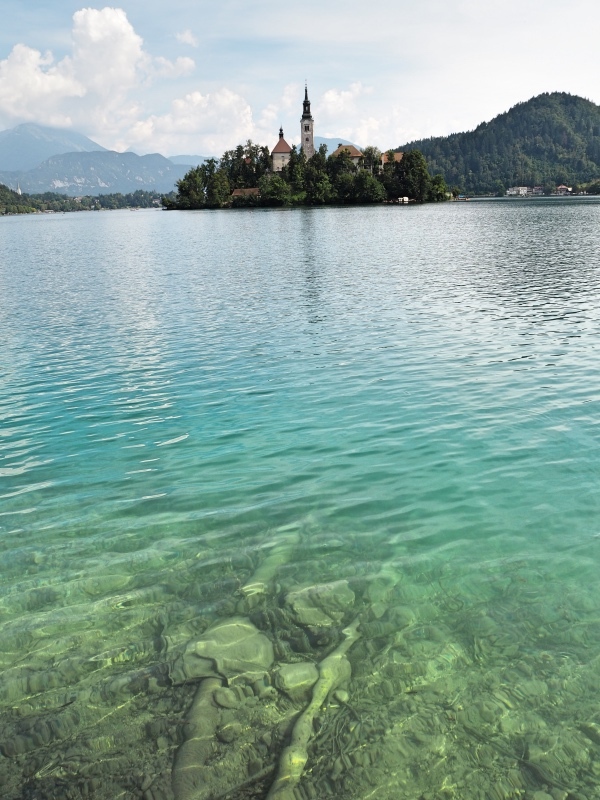 Lake Bled’s water is so inviting, that you will want to jump right in. 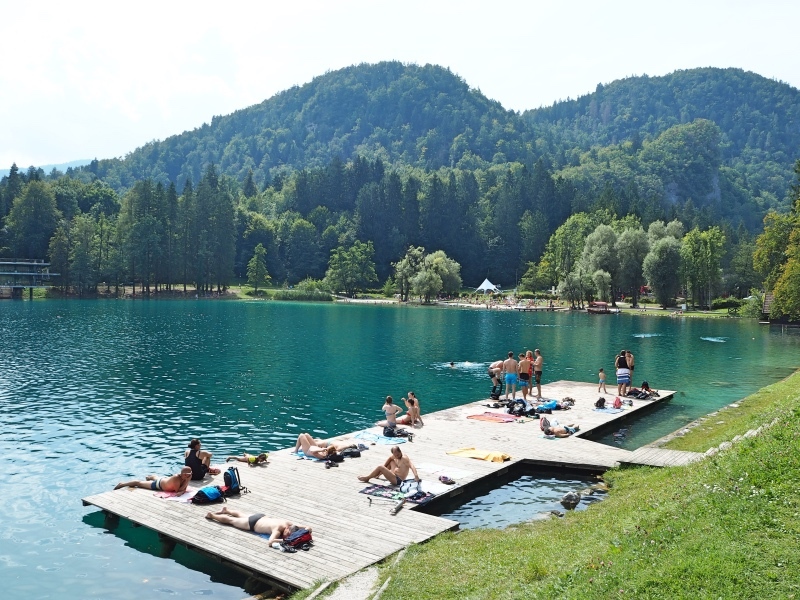 And the best thing is that, unlike the Plitvice Lake National Park, swimming in Lake Bled is encouraged! We highly recommend taking your bathers because the water is really refreshing, especially on a hot day! Of course, this option only makes sense in the summer months; the water would be way too cold in the Alpine winter! A swimming platform on Lake Bled. Slovenians say that you must try the famous Kremsnita while in Bled. The Kremsnita is a delicious cream cake and a speciality of the area. It’s available in most of the restaurants and cafes there. If you like deserts you simply have to try it, and after all that walking you’ll deserve one too! Don’t worry about the extra calories; you’re on holiday! More views of the lake! Of course, there is plenty more to do in Lake Bled, and we didn’t stay there nearly long enough to make the most of it. If possible try and stay there for a few days to allow enough time to really soak in the scenery, to catch a sunrise and to relax in this beautiful part of the world. But expect to find many other people with exactly the same idea! Thank you very much for reading this article. If you liked it, please share it! You did an AWESOME job describing Bled along with beautiful pictures !! Thanks for the post. We felt like we were in a fairy tale when we were here. We also really enjoyed Ljubljana. Thanks very much James for your lovely comment. We are glad you enjoyed the post and pictures. Yes Ljubljana is a very pretty city too and we also enjoyed it a lot. Looking forward to going back to both those places one day! Nice post, Cindy! 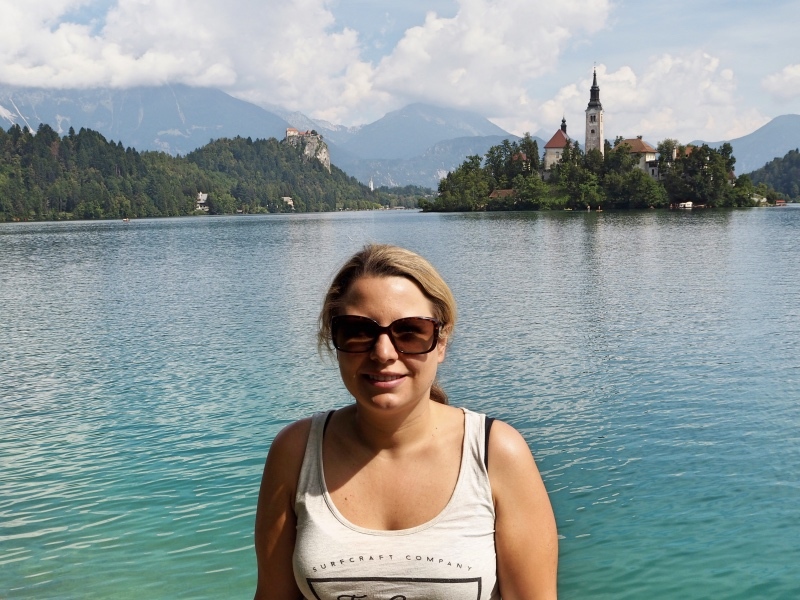 It reminds me of my recent trip to Lake Bled (although mine wasn’t nearly as sunny as yours!–oh the joys of travel). Were you able to visit Lake Bohijn as well? Although it’s not as famous internationally, I found it every bit as enjoyable an experience as that at Lake Bohijn (plus, it came highly-recommended from the locals I spoke to). Thanks Andrew! Yes, we were very lucky with the weather. Although it started very cloudy, the sun came out and it was perfect for photos. No sadly, we didn’t have time to do Lake Bohjin. We heard a lot about it though so we will definetely check it out next time we are in Slovenia. Next time, we plan on staying much longer! We loved Slovenia! Wow, nice place for a vacation! I really enjoyed reading the post. I have never been to Slovenia, but would like to visit lake bled 🙂 Thanks for sharing your experience.